THE return of Geelong’s favourite son understandably has Cats fans purring. Gary Ablett is back — and with it, he brings more hope of adding yet another flag. He’ll now join one of the AFL’s most elite midfield brigades, teaming up with superstar Patrick Dangerfield and skipper Joel Selwood in an on-ball dream team. 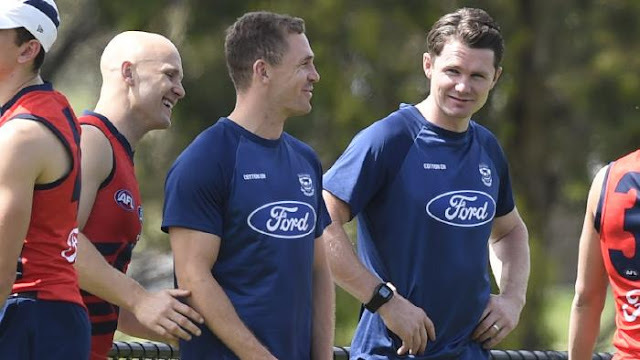 Having such a talented group in the same side will also give Cats coach Chris Scott the freedom to give both Dangerfield and Ablett bursts through the forward line in 2018. Dangerfield kicked a career high 45 goals last season, while Ablett himself kicked 44 goals back in 2010 — his last season at Geelong before defecting to Gold Coast. But while they may both play forward at different stages next year, another new recruit will also help to allow veteran Harry Taylor to return to his preferred position in defence. Former Essendon and Western Bulldogs forward Stewart Crameri joined as a rookie, but can go immediately into the side providing he regains his fitness during pre-season. Crameri has managed only two games in the last two years, due to suspension and fitness issues, but kicked more than 30 goals in five straight campaigns prior to that. The addition of draftees Tim Kelly and Lachlan Fogarty will also give Geelong more zip in its forward line, while its defence will be bolstered by Taylor’s eventual return. It was another outstanding season for Patrick Dangerfield, as he solidified his position as one of the very best in the AFL. Although there wasn’t a Brownlow Medal waiting for him at the end of the campaign, he still averaged 29.9 disposals per game and had more of an impact forward of centre. He kicked a career-high 45 goals from 24 games, but he also put up the best tackling and clearance numbers of his career. He’s undoubtedly one of the best players in the game and he continues to prove that year after year — we expect 2018 will be the same. Displaced as the main man in the ruck, Rhys Stanley endured a reasonably frustrating campaign last season. He battled a couple of injury issues, but also spent a fair chunk of the year in the VFL and finished the season with only 13 senior games to his name. At his best, he can act as a versatile option who can also go forward and impact on the scoreboard. But first, he’ll need to find both form and fitness in order to get an extended run in the side. There’s no doubt Geelong would have eyed Tim Kelly at the draft with the view of playing him immediately. The 23-year-old enjoyed a fine WAFL season with South Fremantle, averaging 26.3 disposals per game and kicking 26 goals from 23 matches. It led to him being recruited to the Cats with Pick 24 in the draft as a mature-aged prospect. He’s predominantly a clearance player who wins it on the inside, but he moves nicely and can clearly go forward and impact on the scoreboard. Expect an immediate impact from Kelly in 2018. Everyone was surprised when Dan Menzel lost his spot in the Geelong team ahead of its qualifying final against Richmond last season. After a campaign that ultimately yielded 40 goals from 19 games, it was a shock for many to see him left out of the side for its most important match of the campaign to date. His lack of forward pressure was cited as one of the reasons for his dismissal, with the two parties then taking their time before agreeing to a new contract. A deal was eventually sorted. Now it’s time for Menzel to put all of that behind him and enjoy a consistent 2018 season.